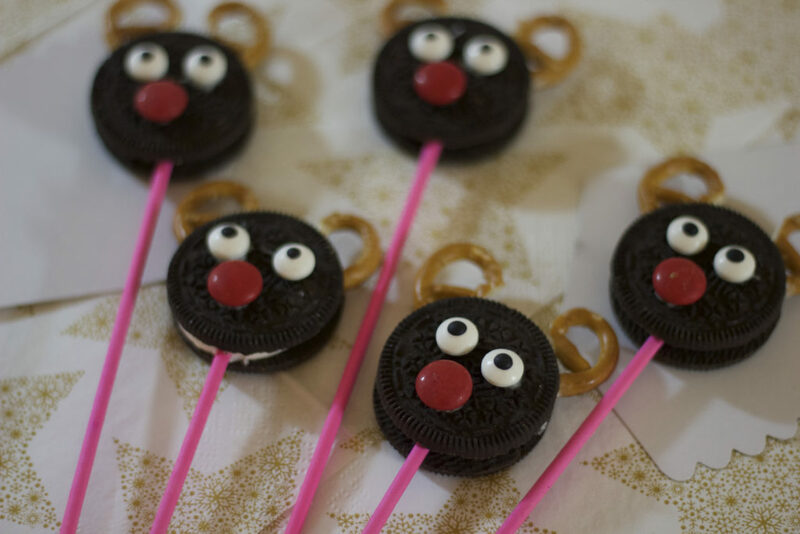 Inspired by Pinterest, I am committed to make the Christmas treats as yummy and easy as possible. So, here are 5 recipes for easy Christmas treats. The quantities in this recipes will depend on how many of those you want to do! The original recipe asks for jumbo olives, but I couldn´t find them in the same color as the small ones, so I ended up using all small ones, which leads me to not using the red pepper as a scarf. They did turn out really cute and tasty, but if you can find the jumbo ones you can even put an red pepper scarf on them, and they will be perfect! 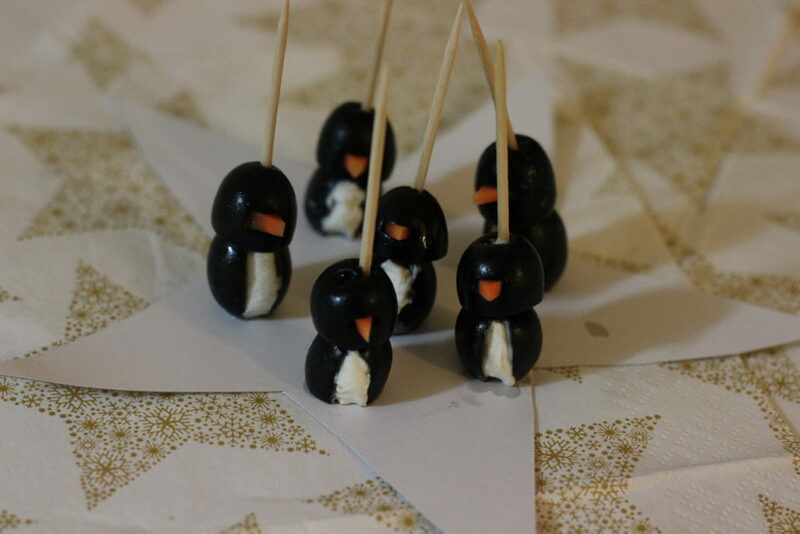 With the help of the piping bag fill the olives with cream cheese, than with the toothpick stabilize the small olive on top of the jumbo olive and stick the carrot triangle as a nose on the small olive. As a final touch use the red pepper stripes as a scarf for your lovely penguin. I had no problems with this ones. They are simple, lovely and look amazing on a christmas table! In the bowl, marinate your mozzarella in olive oil and spices for a couple of minutes or until they are all nicely coated. 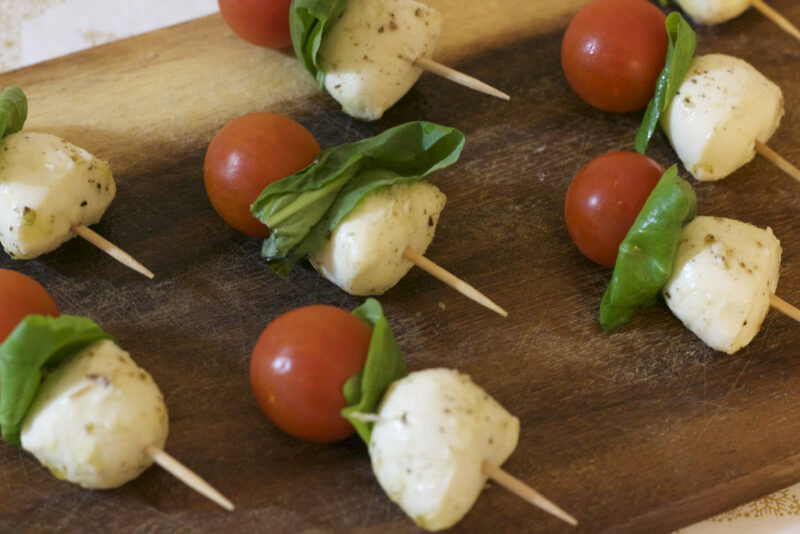 Now, assemble your appetizer in a toothpick putting a piece of mini mozzarella, fresh basil leaves and a grape tomato. And TA DA! This where originally made with whipped cream and seeds for eyes, but the cream I had was not thick enough to hold the top of the strawberry, so I traded it for a marshmallow piece and drew the eyes and bottoms for melted chocolate. I also used a sprinkle star as a top of the hat. Wash your strawberries and cut the bottom (where the leaves are) so it will sit perfectly. Cut the Strawberry again ⅓ from the pointed end. Put a piece of marshmallow over the biggest part of the strawberry, then the small part of the strawberry back on the top. Decorate the “clothes” and eyes of your Santa with the malted chocolate in a piping bag with the small tip. Finish your Santa fixing the sprinkle star on top of the hat. with the help of a little melted chocolate. 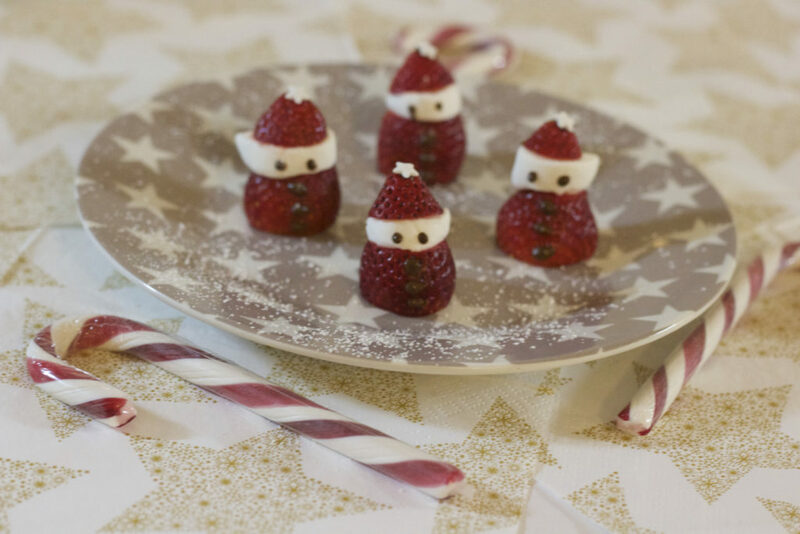 Now you have a cute, small santa that is tasty and somewhat healthy to decorate your Christmas table. I will be honest. The most difficult part of this was cutting the snack pretzels. Gosh these things are hard to cut in 2 pieces. One of them will always break, so have several ones prepared. Take your Snack pretzels and cut it in the middle. This way you will be left with two perfect horns for your Rudolf. Get the Oreo and with a little bit of the icing fix the eyes and the red candy of your choice to the Oreo and let it dry. Wet the cake pop stick and push it in the stuffing so it will stand. Then decorate the other side with the pieces of pretzel as ears. Et voilá! It didn´t even take you five minutes, did it? This is soooo easy! There is though a second, bigger option for this. 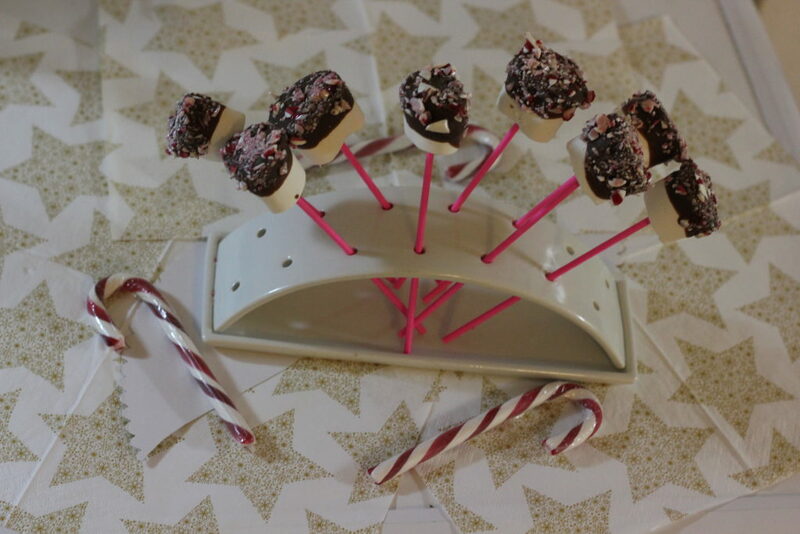 Using Jumbo marshmallows you can use a candy cane instead of the cake pop stick and make it even more beautiful. Take place your chocolate in the bowl and put it on top of the pot with the hard boiling water so your chocolate will melt. DO NOT LET THE CHOCOLATE TOUCH WATER; IT WILL RUIN EVERYTHING! Place the sticks into the marshmallow as far as you can. 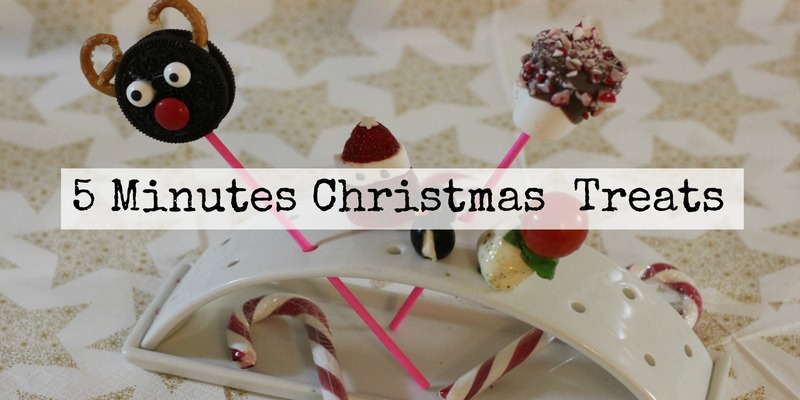 Smash some candy canes in a plastic bag until you are left with small pieces of it and place them on plate. Deep the marshmallows to the half in the chocolate and then decorate them with the pieces of candy cane, then let it dry in a piece o parchment paper. It is as simple as it can get, and kids (and adults too) will love them! 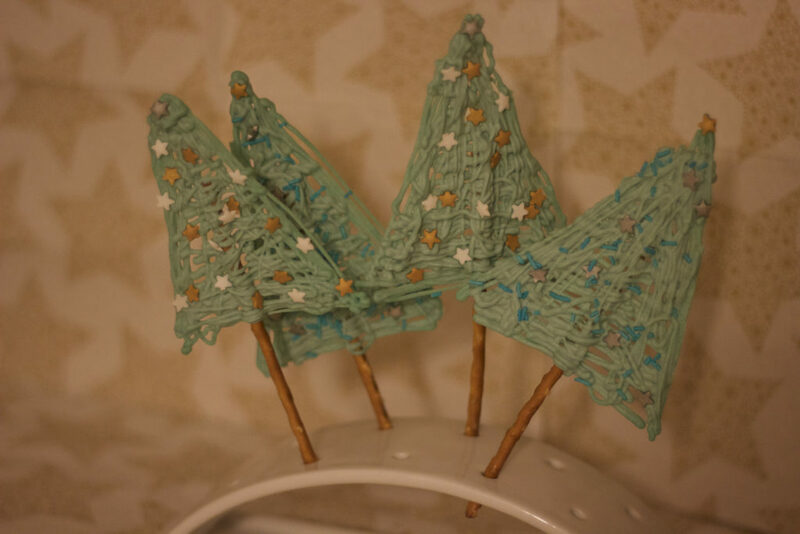 As a Bonus, with melted white chocolate dyed green, you can do this Christmas Tree Toppers. Just place a pretzel stick on parchment paper and draw a christmas tree with the chocolate on top of it. To decorate, just use your favorite holiday sprinkles! You can use this toppers on cupcakes, cakes or all by itself. If you melted and dyed to much chocolate make sure to keep it and use it on next week recipe! And how did you like this recipes? Did you try them? Let me see your creations using the #whenyouliveandyoucook or #whenyouliveandyoubake on Instagram!